Doggie Accessories are no longer "all the rage" for toy dogs exclusively. 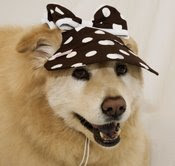 Our plus size dogs can enjoy accessorizing also. Thanks to Tailored Dog, beautiful Puma, shown here, is turning the canine fashion world upside down. 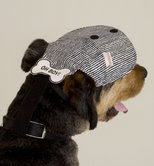 Although visors are Puma's fashion accessory of choice, Rita Green, her owner, and founder of Tailored Dog, has plus size outer-wear available also, including raincoats for those finicky pups who prefer to stay dry during nature's call on a rainy day. Green describes her apparel as Simply Commanding Big Dog Fashion. Most certainly, Puma commands attention when she walks by wearing her adorable Visor in Vogue, which is made right here in the USA. Puma has made many friends in the fashion industry, with appearances at designer shows and a multitude of celebrity introductions. You can find her visiting with the likes of Gold medal-winning gymnast, Shawn Johnson, among others, on her website at Tailored Dog. How do you think Tanner would look in one of these? I do like the idea of protecting his eyes from the brutal Florida sun. Talk about canine style; this is red hot!